The CEC model 1-328-0XXX is a remote Charge Converter designed for use with differential piezoelectric transducers. 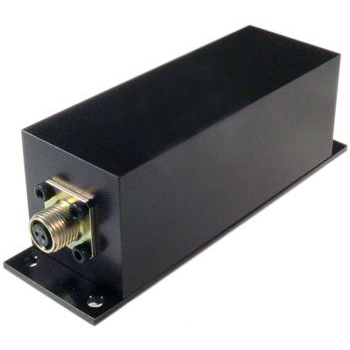 This robust device converts a high impedance charge input to a low impedance AC mV output. Both an acceleration output and a proportional velocity signal are provided. The 1-328 output is proportional to the pC charge input at a constant gain throughout the specified operating range. The 1-328 features a field selectable output gain of x2 or x10 and a frequency response of 5Hz1 to 10 kHz. The 1-328 is powered by a 24 Vdc compliance voltage. The 1-328 output is proportional to the pC charge input at a constant gain throughout the specified operating range. The 1-328 features an optional output gain of x2 or x10 and a frequency response of 5Hz to 10 kHz. The 1-328 is powered by a 24 Vdc compliance voltage.